We’ve all heard about the new dining program launching in the fall of 2017. Some are enthusiastic about the change, but others have their doubts. Regardless, rumors and speculations abound. To clarify the future of on-campus food, The Misc spoke with the Dining Renewal and Improvement Committee about students’ most pertinent questions regarding the change. Special thanks to Assistant Dean for Campus Activities Teresa Quinn, Dean of Strategic Planning & Academic Resources Marianne Begemann, Director of Residential Life Luis Inoa, Dean of the College and Professor of Education Chris Roellke and Associate Vice President of Finance Bryan Swarthout for providing a collective response to the following questions. A: “Bon Appétit focuses on developing menus which utilize ingredients available locally (within 200 miles). The menus will be catered to the season. Not everything will be available locally but Bon Appétit has already begun developing relationships with local farms, including the Vassar Farm Project, and local producers to meet their needs. A: “In addition to the large open space on the first floor, the renovation opened up access to the second and third floor of the dining hall, with plenty of seating in all areas. The entire first floor will be open for dining and this includes the west side for seating and food stations. 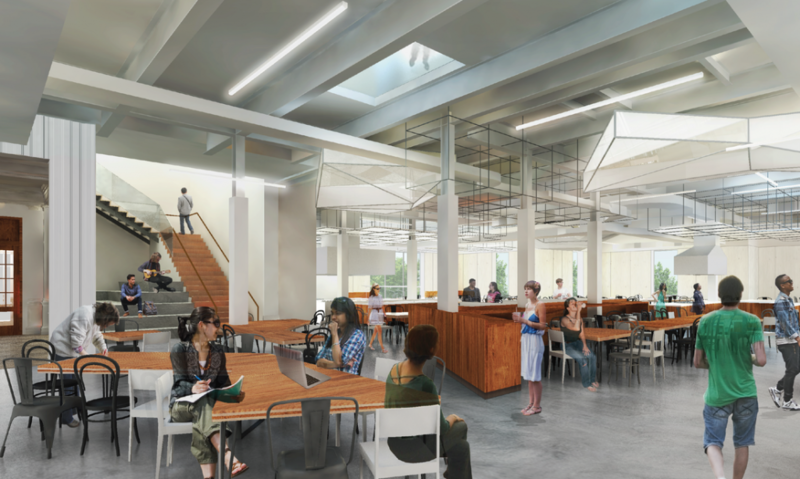 There will be a variety of table sizes and seating options throughout the dining center, and the second and third floor will allow for quieter dining. The Express will move to the newly renovated Kiosk with expanded offerings and hours (breakfast and lunch until late afternoon). Located in the center of campus and designed for a high volume of people, the food won’t be customizable. The walls of the Kiosk will come down, allowing an open space for students to walk in and select from the hot and cold options to grab and go. A food truck will stop at locations such as residential houses and academic facilities during weekday nights and is available for special events. The Retreat and Matthew’s Bean will take cash, VCash and credit. Student can still choose to sit and work in these locations. A Taqueria/ Chipotle type bar will be added at the Retreat. The committee maintains that the new dining plan is open to discussion and constant change and development are still in progress.